The life of Jesus offers many lessons for today’s world-weary traveler. 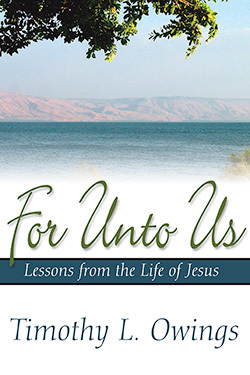 In For Unto Us: Lessons from the Life of Jesus, acclaimed pastor and author Timothy Owings considers Jesus’ life in a series ideal for use during Advent, Christmas, Easter, or any season of the Christian year. Chapters include reflections on the Magnificat, the sermon from the desert, the prayers and teachings of Jesus, and the passion and resurrection of Christ. Jesus is the one person in history around whom the human family still finds hope, inspiration, courage, and joy. His life, death, and resurrection stand as the singular moment around which our calendar revolves and, for Christians, our lives turn. Owings takes us through the life of Jesus with a collection of twenty-five sermons using the Scriptures as his trusted guide. Timothy L. Owings is a church stewardship consultant with Resource Services, Inc. (RSI) in Dallas, Texas. After at 26-year ministry as senior pastor of five churches, he now partners with congregations in developing capital stewardship programs. Owings is the author of Hearing God in a Noisy World and Drowning in Shallow Water. He and his wife Kathie make their home in Augusta, Georgia. 10. Is Daily Bread Enough?